People need to be heard. If you understand this simple principle, you're well on your way along the road to success. Nothing you can say will be nearly as important as what you need to hear the other person say. Practice skillful listening and discover the principle key to effective communication and having a powerful influence with others. Tim was trained as a psychotherapist. His specialty, working with couples. He discovered people got better when he quit trying to tell them what to do and simply focused on hearing their story and helped them listen to each other. He observed if he taught a couple to really listen to each other, their relationship improved. One couple saw how it improved their relationship and used those same skills with their teenagers. It worked. The husband, a CEO, used the same listening techniques in his office and found it really worked there as well! Skillful active listening works for everybody. If you listen to this book and begin to practice the four simple steps, you will increase your odds of success in your career, have deeper richer relationships, and enjoy a more satisfying life. 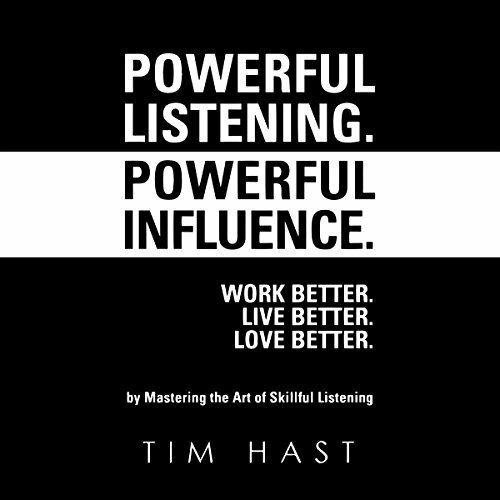 Strong buildup to the value of listening and then a strong wrap up on the value of listening with little in between. Felt like a thin sandwich however the bread was good. It goes through and makes you think about how your mind works to listen in. Nice voice too.